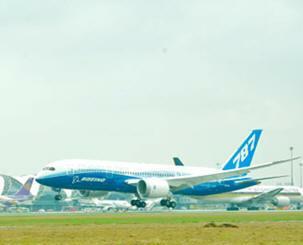 February 10, 2012 - Boeing's new mid-size passenger airplane, the 787 Dreamliner, touched down on Thursday after demonstrating its long-range capabilities by flying nonstop from Seattle's Boeing Field to Bangkok's Suvarnabhumi International Airport a distance of 7,679 miles (12,358 km). The visit is part of Boeing's Dream Tour. The Boeing 787 Dreamliner is a long-range, mid-size wide-body, twin-engine jet airliner developed by Boeing Commercial Airplanes. It seats 210 to 290 passengers, depending on the variant. Boeing states that it is the company's most fuel-efficient airliner and the world's first major airliner to use composite materials for most of its construction. The 787 consumes 20% less fuel than the similarly-sized Boeing 767. Some of its distinguishing features include a four-panel windshield, noise-reducing chevrons on its engine nacelles, and a smoother nose contour. "We are delighted to say 'yindee tonrup' (welcome) to Boeing's 787 Dreamliner on its first visit to Southeast Asia," said Piyasvasti Amranand, president of Thai Airways International (THAI). "This airplane will provide an unparalleled and innovative physical flying experience to our passengers. Coupling that with our acclaimed 'Touches of Thai' onboard service will provide our guests with an unbeatable travel experience." THAI, the national carrier of the Kingdom of Thailand, is among more than 50 of the world's top airlines that will fly the Dreamliner. The airline's first eight 787's are being leased from International Lease Finance Corporation (ILFC). "Boeing is honored that Thai Airways International will be flying the Dreamliner," said Ralph (Skip) Boyce, president of Boeing Southeast Asia, who watched the 787 land in Bangkok. "We're glad it's visiting Bangkok so Prime Minister Yingluck, THAI President Piyasvasti, his pilots and other THAI team members can experience this remarkable airplane firsthand." Also in Bangkok was Ray Conner, senior vice president of Sales and Customer Support for Boeing Commercial Airplanes. Speaking from Suvarnabhumi International Airport, he noted that more than 800 787s are on order, calling that "a testament to the airplane's unique capabilities." "As a result of its innovative new technologies, the 787 Dreamliner offers unmatched operating economics, fuel efficiency and passenger comfort," Conner added. "It is truly an airplane of the 21st century, providing better environmental performance in addition to an outstanding flying experience for passengers and airlines alike. We look forward to demonstrating the airplane's capabilities to the THAI team." During its three-day stay in Thailand, the Dreamliner will be on display for invited media and guests to tour the aircraft interior. On Saturday, the 787 will depart for the Singapore Airshow where it will be on static display.